There is an incredible “wow factor” when one looks at images that show small pieces of the natural world. If you enjoy viewing a bug’s eyes, flower pistils and stamens, lacy details of frost, or any of the millions of “small landscapes” that surround us, then this descriptive book about macro photography is for you! 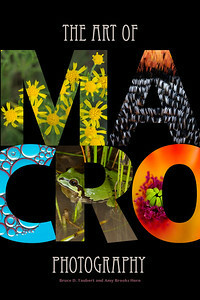 With 200 color photographs and 12 sections about macro photography gear, Bruce and Amy share their passion of macro photography while demonstrating how to capture these images. For PDF purchases, after purchasing, choose the "Return to Merchant" button or check your email for the download link. This download is a 61mb download. Please download directly to a computer and then transfer to mobile devices. Book is best viewed in 2-page display. "There are magnificent universes to discover in the world of macro photography. Amy and Bruce do a brilliant job of helping you take the journey. Enjoy!"